This is one of the best steaks we've ever made. I'm not sure if it was the lovely cut of beef we bought from Chase Brook Natural or the amazing Espresso Glaze. There is something about the flavors of coffee & beef that just go together so well. The little bit of molasses in the glaze adds just the perfect amount of sweetness. We served the steak with some smashed potatoes & creamed red mizuna. Mizuna is a leafy green vegetable that we got from our CSA for the first time this year. They warned us in the newsletter that it can be a little bitter (a bit like mustard to us) & to add some sweetness when cooking it. I decided to cream it like I would spinach using this recipe. I think creaming the mizuna really mellowed it out & it made a great side dish for the beef. Combine. Can be stored in the fridge for 1 month. 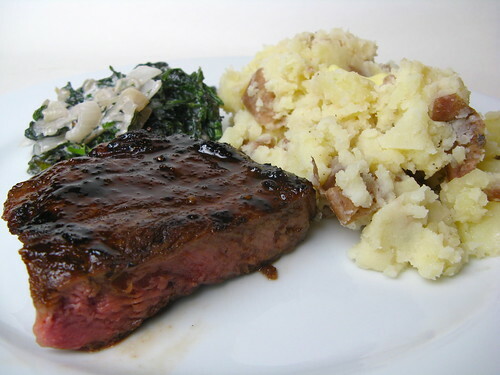 Rub your steak with the prepared Black Espresso Rub & let sit at room temperature for 30 - 60 minutes. Prepare the glaze by mixing the butter, espresso & molasses together. Cook the steaks on an oiled grill over high heat until nicely crusted on both sides. Move to lower heat & finish cooking until desired doneness. Brush both sides of the steaks with the glaze while cooking over the low heat. Let rest 5 minutes before serving. love the sauce/glaze. coriander and espresso, love it. I made grilled espresso kebobs earlier this week with bison from Big Woods and agree that the coffee makes a really nice rub. Mine didn't have the lemon zest, nor did you make a sauce and it called for brown sugar but I bet the results were similar. well now, isn't this nifty! bitter coffee isn't something i've ever had in combination with any meat, and i'm very intrigued. the molasses is an awesome component too. I'm not a coffee fan, but this does sound fantastic! That is a lovely looking steak. I can't imagine the flavours together but I will have to try it! Your recipe sounds delish. Weve havent been happy with the beef that was pushed on us by the markels at chase brooke. Our last steaks we to say the least inedible. Maybe we got a old cow or something? Beth - That's too bad I wonder what cut it was. Beth, they are bankrupt now! You probably got an old steak or their aged cow! Guess you cant trust Chase Brook? But their gone and I guess that's best.